Miniaturization of electronic devices has been ongoing since well before the first room-sized computer was built more than half a century ago. A hand-held smart phone now holds far more data than that behemoth of the late 1940s, but continuing this trend toward tiny has become more challenging. Nanostructures provide solutions while presenting challenges of their own, including how to design and produce them accurately and economically. The University of Delaware's Thomas H. Epps, III, and a collaborator Kai Qi from DuPont Performance Materials have received a grant from the National Science Foundation to investigate a new approach to the challenge of manufacturing small-scale structures that are cheaper, lighter and defect-free. Applications for the work range from generating master templates for digital information storage devices to developing patterns for portable biosensing arrays that could screen and treat a wide array of diseases. The team's approach involves the development of new nano-templates from self-assembling macromolecules using block copolymers. "Basically, what we are investigating is the ability of a suite of DuPont polymers to spontaneously form ultra-small features, whose shape and function can be dictated through processing conditions," says Epps, the Thomas and Kipp Gutshall Associate Professor of Chemical Engineering. Epps explains that most commercial approaches use optical methods to generate structures down to about 20 nanometers. However, going smaller than that threshold has required techniques such as electron beam lithography, a very slow and expensive process, to "write" the desired patterns over areas useful for production. With the new approach, the "writing" will be accomplished by block copolymers, which are two or more polymer chains with different properties linked together. The researchers plan to use a technique that will enable them to alter the innate tendency of block copolymers to self-assemble isotropically, or uniformly in all directions. "This method allows us to achieve more complex patterns such as dashes, crossed lines and curves," says Epps. "It also offers the capability to erase and rewrite the patterns as well as to expand or shrink the 'writing' size of the oriented regions." Epps and his team will work with DuPont scientists to assess the ability of various polymer architectures, or shapes, to achieve the desired patterns. "This is a great opportunity for UD researchers, including faculty and graduate students, to interact with DuPont scientists, to visit DuPont facilities and to get a view into how industrial scientists think about a research problem," he says. "Additionally, it is a chance to combine our fundamental work with DuPont expertise on commercial systems." Qi, senior scientist with DuPont Performance Materials, says the collaborative research leverages DuPont's knowledge in synthesizing structured polymers with UD's extensive thin film fabrication and characterization capabilities. "Structured polymers can also find applications as compatibilizers, adhesives, and coatings," he adds. "This is very exciting work that will bring great insight into the world of miniaturization of electronic devices." 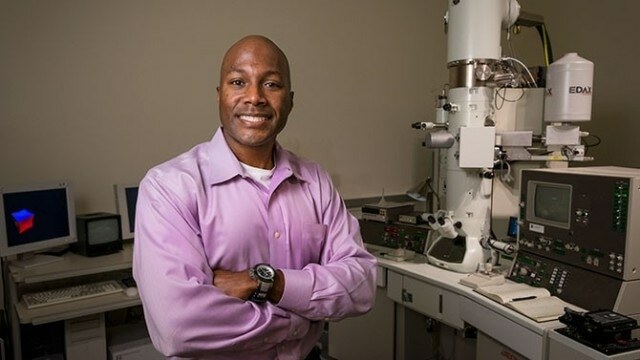 Epps, who has a joint appointment in UD's Department of Materials Science and Engineering, is the principal investigator on the project, and Qi, senior scientist at DuPont, is co-principal investigator. The research, "Directed Self-Assembly of Linear and Star Block Copolymer Thin Films - Oriented Nanostructures with Reduced Feature Sizes via Raster Annealing," is supported through NSF's Grant Opportunities for Academic Liaison with Industry (GOALI), which promotes university-industry partnerships by making project funds or fellowships/traineeships available to support an eclectic mix of industry-university linkages.